Preface: We investigate the dynamics of a "five-link, passive bipedal robot. The passivity in this context stands for the ability of the robot to walk autonomously down an inclined surface without any external source of energy. Previous research efforts in passive walking were limited to four link models with knees or 2-link models without knees with a variety of mass distributions. 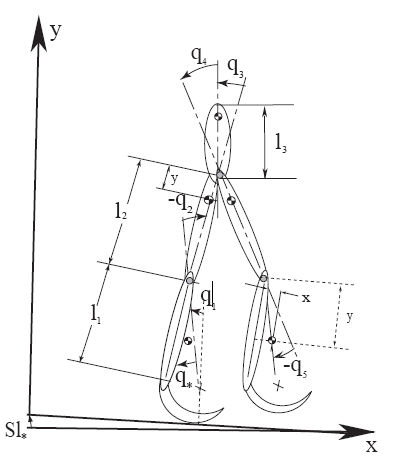 In this study we analyze the dynamics of a "five-link robot with knees and upper body. Approach: We present a planar five-link passive walking robot, which includes an upper body. The presence of the upper body is important in practical applications. The addition of the upper body highly complicates the stability analysis and has a profound effect on gait dynamics. In addition, we investigate the effect of incorporating passive elements such as springs and dampers in the passive joints of biped. We demonstrate that addition of springs, for example, leads to a new set of gait patterns that do not exist in a motion of a completely passive biped. The stability of the proposed model is studied through the use of Poincare map and Floquet multipliers. Results: We were successful in detecting three limit cycles that include three distinct upper body motions. We have investigated the structural stability of these cycles subject to variations in the upper body length. The results demonstrated that the stability can be improved with addition of linear dampers in the hip joints of the model. Also, our investigation demonstrated that erect body posture is only achievable when torsional springs are placed in the hip joints.